Centre-filled toffees, fondants and fudges are just some of the high value products that can be made on the new ServoForm™ Soft Confectionery depositor from Baker Perkins. The ability to deposit distinct components with varying combinations of colours, textures, shapes, sizes and flavours creates a potential for significant innovation and originality in product development. Baker Perkins manufactures a range of AutoCook™ cooking and ServoForm™ depositing systems to produce a wide range of soft candies. Product variety, consistent high-quality and low cost of manufacture are some of the reasons why many manufacturers choose depositing technology ahead of conventional methods. The nature of the depositing process creates great flexibility and process control. Dimensional, shape and weight accuracy are extremely high; fillings are accurately positioned in the centre; and scrap rates are minimal. Compared with the traditional starch forming process, space, labour and maintenance costs are reduced, hygiene is improved and production cycles are cut. The recently launched new generation of ServoForm™ confectionery depositors features higher levels of hygiene, easier operation and less maintenance than previous versions, while retaining the full range of depositing capability. Fast, automatic start-up and cleaning cycles have replaced time consuming manual operations. Priming the pumps at start-up and cleaning the pumps and hopper after every production run are essential, and are now carried out at the press of a button. 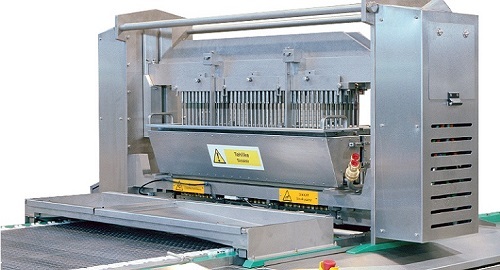 The depositor head is raised and lowered, with purging and washout trays placed and withdrawn automatically. The cycles are pre-programmed and require no operator intervention. The AutoCook™ range of systems to handle every kind of sugar confectionery includes three process technologies developed specifically for soft products. Toffee and caramel AutoCook™ systems incorporate the highly efficient Microfilm™ cooker plus Carablend™ units. For fondant creams the Microfilm™ plus a cooling drum/fondant beater are used, and for pectin and jelly plate pack based Turbofilm™ cooker technology is employed. AutoCook™ are integrated, skid mounted systems for weighing and mixing, dissolving, pre-cooking and colour and flavour addition. The systems are designed for easy installation, maximum efficiency and minimal cleaning and maintenance. Controls can be either stand alone or integrated with upstream and downstream systems.